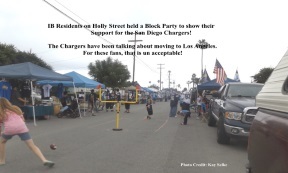 Imperial Beach Residents of Holly Avenue had a block party to show there support for the San Diego Chargers a few weeks back. 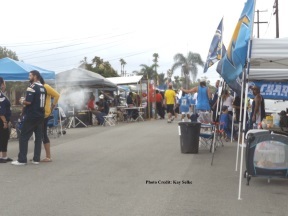 There has been lots of talks about the Chargers leaving San diego and that would be Unacceptable to all those lifelong Charger Fans. 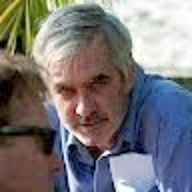 did not feel well for a couple of weeks before that! 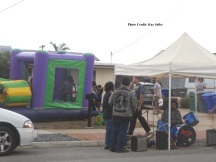 Kay, a longtime Imperial Beach Resident gave me these photographs for publication and it is hoped that if there are any more block parties coming up that someone let me know so I may attend and get more photos and opinions. 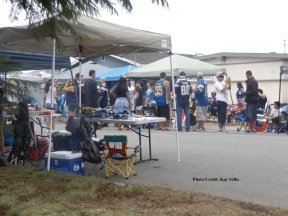 The week the Chargers play the Kansas city Chiefs and the City of San diego has been talking to the owner of the Kansas City team in hopes of swaying their vote to keep the Chargers from leaving town. Unaware to most San diego Charger fans, The team spent its first year in Los Angeles when they came into the AFL in 1961 before moving to San Diego in 1962 and becoming the San Diego Chargers! The Chargers are currently playing in one of the oldest fields in the National Football League. it is the 4th oldest playing field/stadium in the NFL and oened in 1967 for football. Then know as Jack Murphy Stadium it has had a name change and is now know as Qualcomm Stadium. Lambeau Field, home of the Green Bay Packers was built in 1957 and lastly is Soldier field in Chicago built in 1924. However, they went through a extreme remodeling several years back so it is no where near what it was in 1924 and is a rather impressive field now for the fans after it under went its remodeling.